In Cat Box, which plays 2-4 players, players are given 1 hidden Cat card, which determines what cats will score you points. 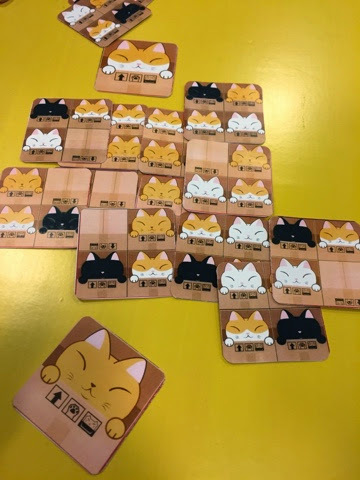 There will be a stack of double-sided cats card and from it, players will draw 2 cards and 1 card from the draw deck will be placed in the center of the table. During your turn, players are allowed to play a card form their hand OR play an opponent's card (keeping the side facing you placed faceup on the table). Players are allowed to cover 1 square of another card on the table. If the card they are playing has a box on the faceup side, then they are allowed to cover up to 2 squares of the cards on the table. The game ends when the draw deck is empty and players count the number of cats of their type that is exposed on the table. In addition, players will choose the biggest cluster of their cats and score an extra 1 point for each of their cats in that cluster. The player with the most points wins! This is another great example of the elegant small box games that Aza had designed so far. It is easy to learn and play yet provides just enough strategy in such a small card game. The clever mechanism which allows players to choose to play a card from their opponents' hand adds a lot of interaction and clever tactics to the game. Even though you are mostly playing the card so as to score more points, there are some strategies for example, encompassing your cats to prevent them from being replaced. Take note that this is the lite version and the full version will be released really soon. The full version seems to have more cards included as well as some dog tokens. I am unclear of the rules yet but when I receive the review copy I will be sure to do a full review on that as well. Clever and innovative and with great art to boot, Aza Chen and Li He games (the publisher that Aza owns I believe) will be a designer and company that I will keep an eye out for in the years to come!